The outer world may be full of full of terrible people doing awful things for insane reasons. You hear about them on the news or read about them online. You stand aghast. You shake your head. You ask why. …But there are monsters. In the inner world, they are legion. They creep through your imagination with free reign needing little more than a dark corner or an creaking floorboard in the night to reach out and grab you by the throat. 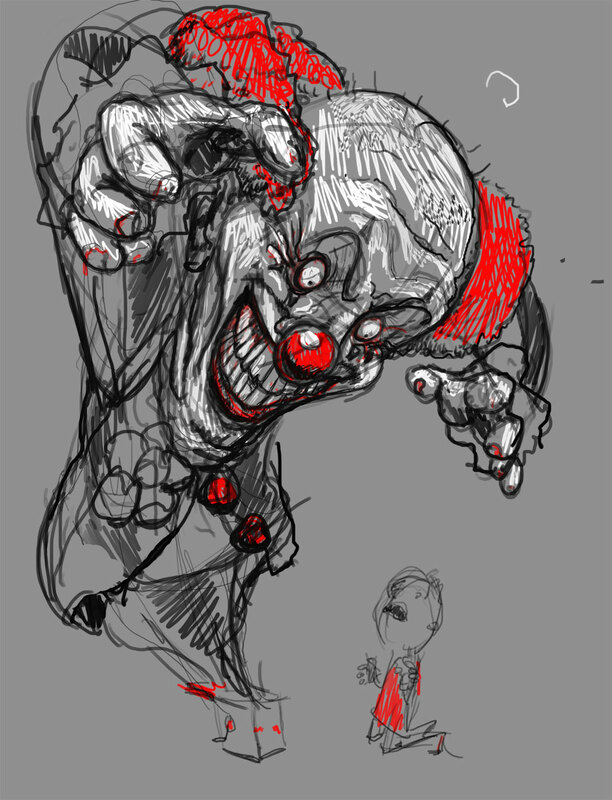 Since I was a child, there have been clowns stalking through my nightmares – waiting. Threadless Tees is running their third annual Threadless Loves Horror competition. 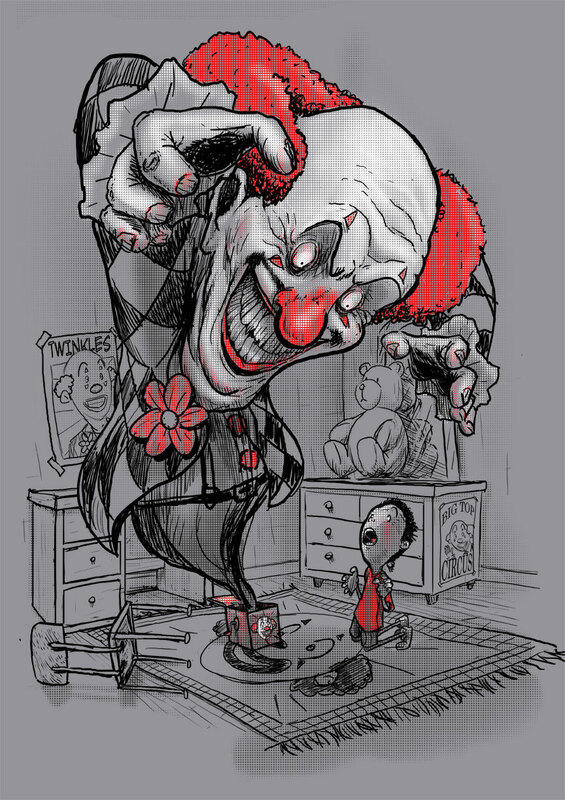 I could think of nothing more horrific than the emergence of a nightmare clown through a jack-in-the-box (the most fundamentally deranged toy ever given to a baby). The artwork for this piece was created entirely in Adobe Photoshop using a Wacom Cintiq Tablet. I began by loosely sketching the concept in various compositions until I found one that felt right. At this stage, I am thinking in broad strokes. What is the audience going to take away from this piece when seen in the blink of an eye? If I am doing my job, then they will see a child shocked and terrified by a horrific clown. Once I find my composition, I have to sell it. This is in the details, and for me, the details are the really fun part. This is where I get to work out just how vile this jester will be. The wrinkles, the jagged teeth, the fake nose that may not be fake. This is also the part of the process where you can catch me making funny faces and weird gestures. It is invaluable to act out the parts of the characters in your scene. I strongly believe that you will be able to draw your subjects with more authenticity if you (at least on some minimal level) have stood in their shoes. Elbows raised with huge snarling grin? Leaning back, hand draw close to the body? 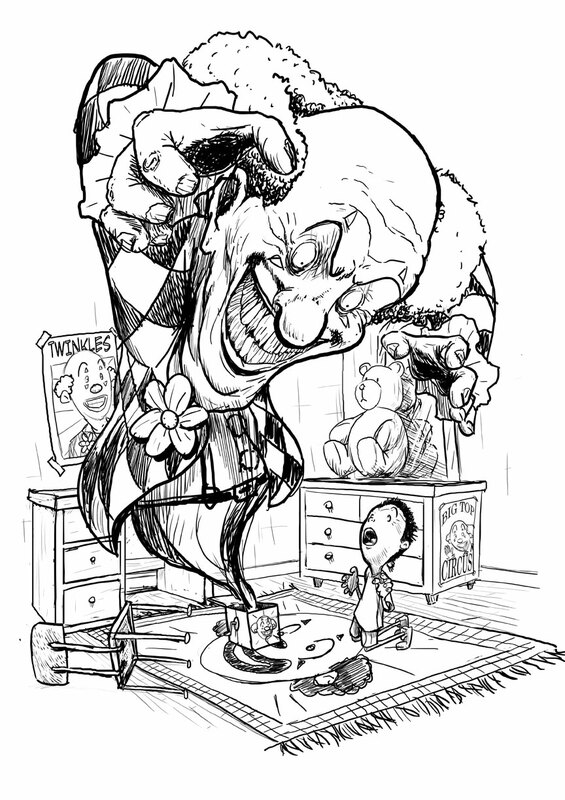 Yes, I was both the clown (his name is Twinkles) and the kid (place your name here if you are afraid of clowns). The next step was digital inking. I created a new layer over my sketch and started to create the final artwork right on top of it. I leave my sketch loose enough that this part is still an exciting, creative process – not tracing. I was surprised at how little of the kid I had in my initial sketch. Next comes the color. I had decided on my black, white, gray, and red palette during the sketching phase. At this point I was just following my plan with a bit more finesse. The colors are rendered using halftones (tiny little dots). You know what these are if you ever looked way too close at the Sunday funnies when you were a kid. You can make the dots so tiny that they are virtually imperceptible or leave them big enough so that the viewer is entirely aware of them. It depends on your preference. For this Piece I wanted to play the middle ground. You can see them if you dig into the illustration, but you probably won’t notice them with a passing glance. If anyone is interested in how to create halftones in Photoshop, let me know. I’d be glad to do a step by step, pure art nerd post about it. The finished piece is to the right. Click the link below to rate it on Threadless. Thank you, and remember…monsters are real.